While the world of communications has changed quite a bit since the Brazilian newspaper O Estado de São Paulo was founded in 1875, sharing high-quality news, analysis and reporting has remained its constant goal. In order to provide information in real time, the influential paper launched the portal Estadao.com.br in March 2000. 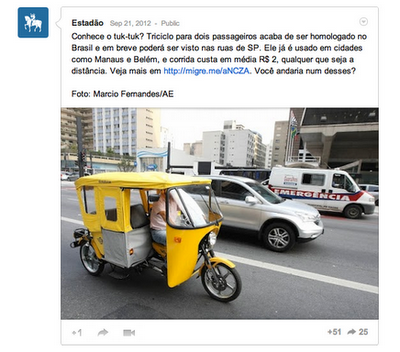 And with social media a growing priority, Estadão launched its +Estadão page on Google+ in the second half of 2011. Over time, Estadão has built Google+ into its content strategy as a result of the platform’s unique ability to stimulate conversation and discussion. Cláudia believes that Estadão’s audience is interested in a network that’s not just social, but also enables knowledge exchange. With this in mind, the team publishes content specifically relevant to Google+ followers, rather than replicating the same content across all of the social media outlets that Estadão uses. They’ve found that the network responds particularly well to serious themes, so posts cover topics like economics, politics and current affairs, often with an informal tone. But it’s not only the exchange of ideas through the written word that Google+ facilitates for the newspaper. Estadão takes advantage of the visual strengths of the platform by posting full images, captivating video content and stimulating face-to-face discussion through frequent Hangouts, the free, high-quality video chat feature unique to Google+. Plenty of creative channel-specific initiatives are underway: a daily video of economic analysis, a nightly podcast summarizing the main news of the day and a weekly trailer previewing new cinema releases. Estadão uses Google Analytics to understand visitor behavior, and it’s clear that Google+ is having a positive effect on traffic to the portal. Over a five-month period, Analytics showed that visitors to the Estadão site from the Google+ page increased 540%. At the same time, this traffic generated an uplift in page views per visit of 18%. Currently, the Estadão Google+ page has over 500,000 followers. Want to replicate the brand’s success? Read all about it in the full case study, and feel free to share your experiences with us on our AdSense +page. Every Friday, we’re posting Google+ tips to help publishers make the most of all of the features and resources available. Be sure to check back each week for the latest in our educational Social Fridays series!